Pennant bowls this week saw both sides play at home, and in contrast to last week which saw prefect conditions, this week was probably some of the worst conditions for a long time with extremely strong winds for the entire afternoon. First division had a great result against the Kaniva side, winning by 41 shots. Geoff Gazelle, Darryl Argall, Daniel Danisch and Josh Cook led the way winning by 16 shots (33 to 17), Peter O*Loughlin, Greg Cook, Rick Danisch and Judith Albrecht also had a good win, by 15 shots (25 to 10), Rob Pyers, Cliff Unger, Darryl Both and Merv Roberts won by 11 shots (26 to 15) and Alan Krahe, Wayne Albrecht, Bob Gooding and Ron Gaulke were unlucky to go down by a single shot, 19 to 20. 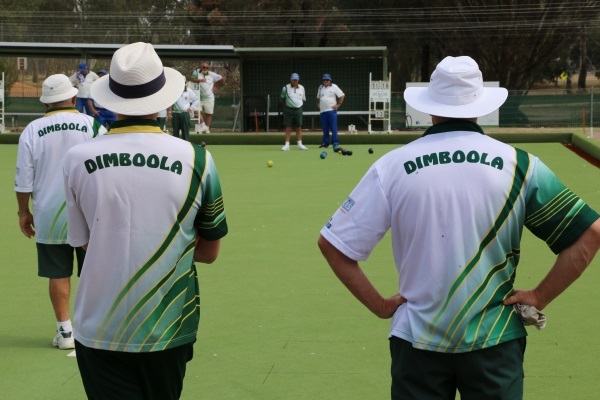 This result was very important as far as the top four is concerned as it has now given Dimboola a buffer over both Kaniva and Nhill who are in fifth and sixth positions respectively, as upcoming opponent include top side Coughlin Park this week and Nhill the week, with both matches being played away from home. Third Division played the second placed Horsham Golf 2 and had a close game going down by 5 shots. Robert Clark, Max Walker, Gordon Miller and Ian McRae recorded a good win winning by 10 shots (25-15), Bryan Beattie, Peter Ross, Bill Eldridge and Ian Barry went down by 4 shots (15-19) and Trevor Werner, Frank Neagle, Bill Ballard and Alex Orcsik found the windy conditions hard to handle going down by 11 shots (14-25). This has left the third Division team in third spot on the ladder and they need to regroup next week to consolidate their position. Last week the winners of social bowls were the dynamic pair of Mary Argall and Alex Orcsik. Emergencies are Mary Argall and Lois Gaulke.